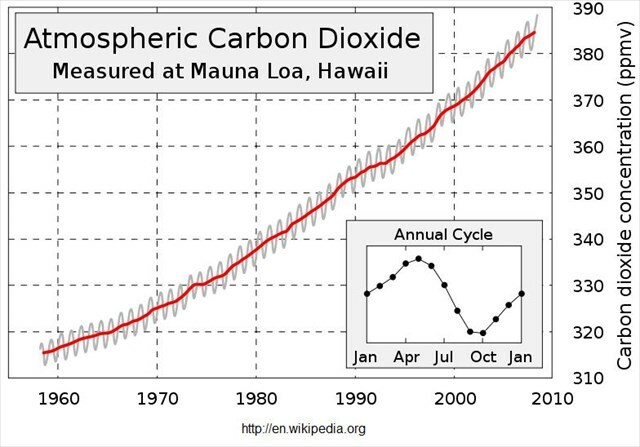 (88) Not only is the infamous hockey stick a fraud, but the Keeling Curve is as well. There are several reasons it is fraudulent. I don't know which of these reasons is more important, so I'll let you decide. 1. The base is non-zero. This is so the graph will be skewed upward, it will have a much greater slope, and encourage everybody to "do something!" If the base were 0, the graph would be much, much flatter even with these exaggerated values. Keep in mind "parts per million volume". 2. Next, the top. It is topped off at ~390 ppmv when in fact it SHOULD be 15,500 ppmv. 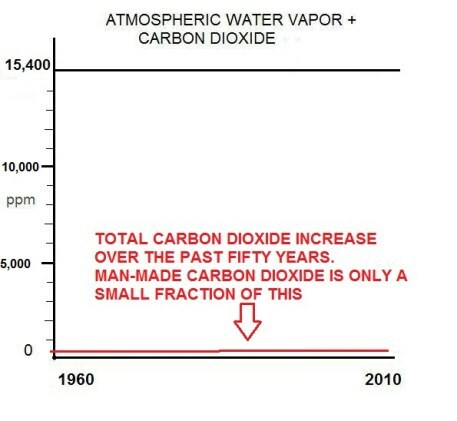 This is because water vapor is THE dominant greenhouse gas. Please, don't anyone pretend that water doesn't count. It really does. Yes, it rains, but "old water" behaves just the same way "new water" does. And their IR spectra are remarkably similar. Biggest difference is that water vapor, at 1.5%, is 15,000 parts per million volume. The annual increase in atmospheric CO2 of ~1.36 ppmv is insignificant. Not only is the infamous hockey stick a fraud, but the Keeling Curve is as well. Neither water vapor, liquid water, nor carbon dioxide warm the Earth. Absorption of infrared light by any of the substances in the atmosphere is just another way for the surface to heat the atmosphere and be cooled in the process. In the end, it is no different than conduction and convection. Into the Night wrote: Neither water vapor, liquid water, nor carbon dioxide warm the Earth. Absorption of infrared light by any of the substances in the atmosphere is just another way for the surface to heat the atmosphere and be cooled in the process. In the end, it is no different than conduction and convection. Firstly, water vapor, water held as droplets in clouds and CO2 DO warm the earth. So why are you pretending otherwise? Clouds hold heat and can only rid themselves of this by conduction and convection. Since this takes time this is a delayed or "blanketing" effect. The warming of the clouds and the humidity in the air occurs essentially instantaneously because energy from the sun enters as radiation which moves at the speed of light. More importantly why are you changing the subject which was about the intentional scaling of CO2 and H2O to make CO2 to look important when it, as a trace gas, is barely detectable in the maintenance of heat? Rhetoric is NOT science. Please stop playing your rhetorical games. A blanket does not "warm" you at night, but it retains your body's warmth in the same way carbon dioxide and water vapor retain earth's warmth. You of course know this, but you think you can play rhetorical games and deceive people. It is most unintelligent and anti-scientific of you to do so. Stop it. If you pay attention to his postings you will soon perceive that he actually believes what he is posting. Those are the problems I was talking about. It's like talking to a log. The daylit skin of the International Space Station will reach 250 deg F. There is nowhere on Earth that reaches that temperature. If water vapor, water, or CO2 warm the Earth, why is the daylit side of the Earth COLDER? Clouds hold heat and can only rid themselves of this by conduction and convection. Clouds are liquid water (or ice). Liquid water has a high specific heat value. It takes a long time to heat them up, and a long time to cool them down. A cloud is like a thermal 'anvil' floating there in the sky. Clouds are formed by the presence of water vapor and the convection. They only exist BECAUSE OF conduction and convection. Since this takes time this is a delayed or "blanketing" effect. Blankets work by reducing heat. Clouds have a high conductivity of heat, just as water does. They do not act like insulators. Quite the opposite. Clouds are good conductors of heat. The warming of the clouds and the humidity in the air occurs essentially instantaneously because energy from the sun enters as radiation which moves at the speed of light. WRONG! Liquid water has a high specific heat index. It takes quite a lot of time to heat up a cloud. The air around a cloud will heat up before the cloud does. The surface will heat up the fastest. At night, the reverse happens. The surface cools the fastest, the air around a cloud will cool faster than the cloud does. Because it is basing its argument on the magick properties of CO2 and water vapor to 'warm the Earth'. It is nice that StarMan made his point by putting the graphs into a proper baseline, and his argument is sound as far as the misrepresentation of data the Church of Global Warming likes to use, but the argument IS assuming properties of CO2 and water, and water vapor that just aren't there. Absorption of infrared energy by CO2 and water is just another way for the surface to lose heat to the atmosphere, just like conduction and convection. Big hairy deal. (88) I first saw the word "unintelligent" while reading the Potsdam Declaration. It is a brilliantly worded and important document which reminds readers of the utter folly of stubborn ignorance, as demonstrated with such devastating effects in Japan. This very same stubborn ignorance is at play in the climate change fraud today by those who would commit trillions of dollars for more phony research, subsidies, cap and trade, and waste worldwide, all of which will achieve nothing. ... The prodigious land, sea and air forces of the United States, the British Empire and of China, many times reinforced by their armies and air fleets from the west, are poised to strike the final blows upon Japan. This military power is sustained and inspired by the determination of all the Allied Nations to prosecute the war against Japan until she ceases to resist. The result of the futile and senseless German resistance to the might of the aroused free peoples of the world stands forth in awful clarity as an example to the people of Japan. The might that now converges on Japan is immeasurably greater than that which, when applied to the resisting Nazis, necessarily laid waste the lands, the industry and the method of life of the whole German people. The full application of our military powers, backed by our resolve, will mean the inevitable and complete destruction of the Japanese armed forces and just as inevitably the utter destruction of the Japanese homeland. The time has come for Japan to decide whether she will continue to be controlled by those self-willed militaristic advisers whose unintelligent calculations have brought the Empire of Japan to the threshold of annihilation, or whether she will follow the path of reason ... . In an effort to minimize the losses among the civilian population and to counteract false propaganda concerning Allied aims spread by the Japanese High Command, the Twentieth Air Force and the Far East Air Forces on 28 July began dropping warning leaflets to announce seventy-two hours in advance the names of the cities marked for destruction. In addition to notifying all civilians to flee to safety, the leaflets advised them to "restore peace by demanding new and good leaders who will end the war." As a direct consequence of the failure of the Japanese Government to accept promptly the terms of the Potsdam proclamation, Japan became the victim of the most destructive and revolutionary weapon in the long history of warfare - the atom bomb. The first bomb of this type ever used against an enemy was released early on 6 August from an American Superfortress over the military base city of Hiroshima and exploded with incomparable and devastating force. The city was almost completely and uniformly leveled. It was to spare the Japanese people from utter destruction that the ultimatum of July 26 was issued at Potsdam. The Japanese Government are ready to accept the terms enumerated in the joint declaration which was issued at Potsdam on July 26th, 1945, by the heads of the Governments of the United States, Great Britain, and China, and later subscribed by the Soviet Government with the understanding that the said declaration does not comprise any demand which prejudices the prerogatives of His Majesty as a Sovereign Ruler. The Japanese Government sincerely hope that this understanding is warranted and desire keenly that an explicit indication to that effect will be speedily forthcoming. On August 11, the United States rejected Japan's demand to retain the Emperor as their Sovereign Ruler. A Democratic government ruled by the people and no other must follow. On August 14, after no response was received, 828 bombers and 186 fighter escorts made the final air attack on Tokyo. The claim that the atomic bomb attacks on Hiroshima and Nagasaki were unnecessary is refuted by the incomprehensible instransigence of the Japanese government. On the night of 9–10 March ("Operation Meetinghouse"), 334 B-29s took off to raid with 279 of them dropping 1,665 tons of bombs on Tokyo. Approximately 15.8 square miles of the city were destroyed and some 100,000 people are estimated to have died. The Operation Meetinghouse firebombing of Tokyo on the night of 9 March 1945 was the single deadliest air raid of World War II, greater than Dresden, Hamburg, Hiroshima, or Nagasaki as single events, and still Japan did not surrender. Even after suffering two atomic bomb attacks, still Japan refused to surrender. It was only after the massive attack on Tokyo by 828 bombers that they realized their foolishness and futility. Agreed. Rhetoric is the process of presenting arguments. You seem to think it means something else. Please stop playing your rhetorical games. I am playing no game. A blanket does not "warm" you at night, but it retains your body's warmth in the same way carbon dioxide and water vapor retain earth's warmth. WRONG. A blanket keeps you warm by reducing heat. A blanket is a thermal insulator. A cloud is a very good conductor of heat (just as liquid water is). Do not confuse heat conductivity with specific heat. Carbon dioxide has no significant properties for heat conductivity or in specific heat. It behaves just like any other gas in the atmosphere. You of course know this, but you think you can play rhetorical games and deceive people. I am not trying to deceive anybody. You can look this stuff up if you doubt me. I expect you to do your own research. It is most unintelligent and anti-scientific of you to do so. Weren't you the one trying to convince Wake that insults are not an argument??? Why should I stop using math and science? Why should I accept properties of water and CO2 that aren't there? You two can go look up the properties of carbon dioxide and water anytime you want to. You can go look up the Stefan-Boltzmann equation anytime you want to. You can go look up the 2nd law of thermodynamics anytime you want to. You can go look up the temperature and energy profiles of the atmosphere anytime you want to. You can go look up why science is nothing more than a set of falsifiable theories anytime you want to. I am not going to deviate from these just to agree with you. Into the Night wrote: If water vapor, water, or CO2 warm the Earth, why is the daylit side of the Earth COLDER? 1. Why is the daylit side of the Earth colder than WHAT? Aren't you the one trying to pummel people with the Stefan-Boltzmann Equation? Why is it that you don't even attempt to use that to answer your own question? 2. You tell us that "clouds are like a thermal anvil" and then you tell us that StarMan is assuming properties of water that just don't exist. I think that you better make up your mind. 3. After I say clouds are formed because of conduction and convection why do you repeat me as if you have just given us an important fact? 4. That is a new one - blankets act because they reduce heat. You do not appear to even understand insulation. 5. Why do you continue to give us your interpretation of "magick" in which the science of physics does not operate? Into the Night wrote: You two can go look up the properties of carbon dioxide and water anytime you want to. It would be nice were you to understand even ONE of the things that you speak of. first, 50 years of measurements are not relevant to propose any serious climate model , the temperature curve doesn't even follow this curve, although IPCC ( not a scientific organisation ) based the AGW on correlation between CO2 and temperature. second, the CO2 from ice cores cannot be taken in consideration as the air bubbles still in contact with atmosphere for hundreds years . third, for last 2 millions of years we are considered to be in cold time as before we couldn't find any piece of ice in northern hemisphere, so before humans could make fire ! Fourth, CO2 has not linear effect on warming , doubling CO2 will not add the same temperature difference and still has only 10% part of global warming. Fifth, the oceans contain much more CO2 than atmosphere and much more energy , so the understanding of global warming should start with ocean currents analysis. Climate science is about energy balance and clouds albedo should be part of the equation ! 1% of albedo change will have the same impact than pretending AGW. Finally, the most important thing is to stop fossile energy and support sustainable projets, not because CO2, but only because pollution and other aspects. stop arguing, now it's time to do something ! if you want to reduce CO2 , rebuild the forest. Places like Weyerhaeuser and Georgia-Pacific are doing just that. They need the trees for the products they produce. Of course the time period is relevant but the AGW True Believers don't understand that. They have been using ice core research because it plays into their hand. There is another way of measuring historic levels of CO2 and it isn't being used because it demonstrates entirely different results. Some types of plants have a linear relationship between the number of stomata on their leaves and stems and the levels of CO2 in the air. There were two small studies of these plants retrieved from mud pits or fossilized and what they reported were dramatically different from ice cores. For instance, in the time of Christ it was the Roman Warm Period. At this time the levels of CO2 were at or perhaps over 400 ppm (other research shows CO2 following MGT by about 800 years) The other study showed that 7,000 years ago that the levels were at least 350 ppm. These source also show VERY rapid changes in CO2 levels in the range of less than a century which puts the damper on most of the propaganda that the AGW True Believers are trying to pawn off on an unsuspecting population. CO2 has almost NO effect on warming for a very simple reason - CO2 absorbs radiation in a very narrow set of bandwidths. Four to be exact. And H20 covers three of those. The fourth band has the problem that there is almost no energy in it. So any levels above about 250 ppm or so have already absorbed all the available energy and there simply is no further effect on the climate. So any higher levels of CO2 act as coolants because CO2 has a higher specific heat capacity than other common atmospheric gases hence not radiating as early as other gases as it absorbs heat via conduction. This effect is small but is present. What does larger amounts of CO2 do? It increases plant growth dramatically. And since 70% of the Earth is covered in water, Plankton and Algae are most strongly effected. Because of this the sea life is returning to pre-industrial era fishing. There are now more blue whales just in the Pacific Coast pods than were thought to exist in the world. Everything an increase in CO2 has done has been positive. Only those who have to have something to hate disagree. hubble wrote:if you want to reduce CO2 , rebuild the forest. Places like Weyerhaeuser and Georgia-Pacific are doing just that. They need the trees for the products they produce.They are farmers. Logging companies didn't replant forests. Neither did the city, county, state or Federal gov'ts. Gifford Pinchot brought the forest conservation techniques developed in the colleges of europe. He hammered his way into the U.S. gov't, developing enough power to lead, teach, cojole, & beg U.S. & private forestries to implement such practices. Without Gifford Pinchot, the United States would have been a score or two years late(too late?) to good forest management. It is also undefined. Something else the Church of Global Warming can't seem to get their head wrapped around. CO2 has almost NO effect on warming for a very simple reason - CO2 absorbs radiation in a very narrow set of bandwidths. CO2 has many bands of absorption. Most are outside the infrared spectrum. For the infrared portion, true. And H20 covers three of those. It covers one of them. Water also has a many more absorption bands. The fourth band has the problem that there is almost no energy in it. Energy is energy. Are you saying infrared light has no energy? So any levels above about 250 ppm or so have already absorbed all the available energy and there simply is no further effect on the climate. Adding more CO2 adds more absorption in the bands of CO2. The affect of CO2 (or water) absorption for infrared frequencies is the material becomes warmer. Due to the nature of the concentration of CO2 in the atmosphere, that thermal energy is easily dispersed into the surrounding atmosphere. The same thing occurs with water, even though it has a higher concentration in the atmosphere. CO2 does NOT have a higher specific heat. It is about the same as any other gas in the atmosphere. ALL materials above absolute zero radiate. It is neither first or last. It is simply radiating like everything else does. as it absorbs heat via conduction. CO2 absorbs thermal energy by conduction, convection, and absorption; just like any other gas in the atmosphere. We don't know how many blue whales there are in the world. Blue whales are not hunted anymore by most of the world. Good old Big Oil saved the whales. Everything an increase in CO2 has done has been positive. Indeed, we couldn't survive without the stuff. Only those who have to have something to hate disagree. This point is usually countered by the Church of Global Warming by bringing up the toxic effects of concentrated CO2...basically the fallacy of building a strawman by taking an argument to extremes. Logging companies didn't replant forests. They did and they still do today. Neither did the city, county, state or Federal gov'ts. Basically true (with a few minor exceptions). Gifford Pinchot brought the forest conservation techniques developed in the colleges of europe. He hammered his way into the U.S. gov't, developing enough power to lead, teach, cojole, & beg U.S. & private forestries to implement such practices. He didn't plant any forests either. His idea of conservation was simply not to cut trees in the first place. His technique of overstating the 'disaster' of our forests was typical of the liberal left. Taken to the extremes it has been taken to today, forest fires that would have been minor are now devastating things today, since the management of trees and brush is curtailed. Fire can now more easily get up into the canopy and cause real damage. Fortunately, we have places like Weyerhaeuser to replant trees in forest that has burned. They are incredibly well equipped to the task of planting, nurturing, thinning, and managing the forest to produce the bounty we all benefit from. They don't just log trees. Rhetoric is NOT science.///Agreed. Rhetoric is the process of presenting arguments. You seem to think it means something else. No, rhetoric is NOT "the process of presenting arguments." Rhetoric is the process of playing word games. I have no more time to listen to your nonsense. (1285) What had the surrender of Japan to do with anything? What had the surrender of Japan to do with anything? Had you read my message, you would not ask that question. Then by all means I'm sure you wouldn't mind telling us the absorption bands of CO2 that are not in the IR. The point of saturation is obviously lost on the climate change sharia jihad. Clear nights are cold nights, as water vapor clouds absorb vast quantities of heat and retain it. The carbon dioxide concentrations are the same whether the night is clear or cloudy. The temperature differs dramatically. There is a lesson for the climate change sharia jihad, but it will not learn. Now you want to argue about the meaning of 'rhetoric'. Who's playing word games? Like so many before you, and so many to come after you, redefining words is a favorite hobby of the left. If you want to speak another language, that's your business. I use English. I already did. There's an absorption band in the UV, but most are in frequencies lower than infrared. Of course, it is not possible to determine the amount of effect the cloud has, since there is no way to set up a control reference. (88) rhetoric - noun. language designed to have a persuasive or impressive effect on its audience, but often regarded as lacking in sincerity or meaningful content. "all we have from the opposition is empty rhetoric"
rhetoric - noun. language designed to have a persuasive or impressive effect on its audience, but often regarded as lacking in sincerity or meaningful content. Yup. That's about all you have here. Nope, quite false. Clouds consist of liquid water droplets, not water vapour. Clear night are cold nights because most of the IR radiated by the ground goes straight into space; cloudy nights are warmer because that IR is instead absorbed by the water droplets, which are thus warmed and radiate IR, some of which travels back down to the ground. The net effect is that less IR is radiated by the ground. It's the same principle as the greenhouse effect, but much stronger because water absorbs IR much better than any gas. Nope, quite false. Clouds consist of liquid water droplets, not water vapour. Good catch here. You are correct. Clear night are cold nights because most of the IR radiated by the ground goes straight into space; cloudy nights are warmer because that IR is instead absorbed by the water droplets, which are thus warmed and radiate IR, some of which travels back down to the ground. This part is wrong. You cannot heat the ground with something that is colder. The clouds don't heat the ground, they just stop it cooling so fast by radiating IR towards it. This reduces the net rate of heat loss by the ground. Only if they are already warmer. Liquid water has a high specific heat and a high heat conductivity. If a cloud is cold, it will actually cool the surface beneath it faster as it tries to heat the cloud. Such a situation will cause an unstable air mass, and usually precipitation (if the cloud is big enough). You cannot trap light. You cannot trap heat. Are you seriously suggesting that clouds are warmer than the ground below them? Have you ever climbed a mountain? Clouds can easily be warmer than the ground below them. I don't need to climb a mountain. I fly aircraft. Sure you do. What are you rated for? Most of the time no, but it happens....it's called a thermal inversion. Example would be a warm front pushing up and over a cold wedge. Very typical in a freezing rain event. What diff does it make to you? It's also very typical of weather in the Pacific Northwest, even without freezing rain (just our famous drizzle, if that). Surface Defect simply doesn't know the first thing about science. A temperature inversion is a thought that he has never encountered. Since it would be so plain that you don't know what a plane is we could all get a good laugh. Sure, thermal inversions occur occasionally, but, as you say, temperature usually falls with height (it has a name - the lapse rate) and clouds are generally colder than the land that are above. But they still emit IR, and some of that IR reaches the ground. Hence they still reduce the net rate of heat loss by the ground. That's why cloudy nights are generally milder than clear nights.